If you are on track to receive your degree in fast-paced business or international studies, don’t let your college years pass you by without a chance at studying abroad. If for some reason none of the programs you have encountered so far have drawn you in, consider the unique features of international relations and industry you could immerse yourself within in Armenia. This tiny country, once governed by the Soviet Union, has a standout geographic location that puts it at the gateway between Eastern Europe and the Middle East, historically the ground from which some of the most ancient civilizations arose. Armenia may be an underrepresented study destination because of its small size and relative obscurity on the scene of major players, but don’t underestimate the potential of unique research and historical context available to those who choose to spend time here. The experience of study in Armenia gives American students, especially those focused on global business or policy making, the unique chance to witness first-hand the rapid changes taking place on an international economy. In a very short length of time, the Armenian political and economic scene has gone from one that was tightly controlled by a large government to one more akin to a free market. In fact, the entire region of Eastern Europe in which it is set has been literally overrun with multinational corporations and investors who sense lucrative markets and fertile business environments. Students seeking study abroad programs in Armenia will find a few of interest, some originating from colleges and universities, others through government funding. Scholarships for student travel in this region are matched to student passion and intention, and may be found for those who have well-defined plans of study that necessitate them experiencing first-hand the location of Armenia. The National Security Education Program’s David L. Boren Scholarships are focused on dangling monetary incentives in front of students who wish to study abroad for a year in non-traditional countries, such as Armenia. Owing to the competitive nature of the program, a few hundred candidates are chosen from among thousands, which means your academic record must be stellar and the more innovative your program, the better chance at an award you will have. In fact, if you are at all interested in the national security aspect of the program you will be even better positioned for full funding. The hitch to the program is that this is a scholarship for service situation, meaning you are expected to work for the feds after you graduate for a time. Differing versions of the scholarship are open to both undergraduate and graduate students. Awards are up to $25,000, and are a great incentive if you are looking for a job-education package deal. Research Fellowships are regularly awarded to graduate and post-graduate researchers who are interested in conducting research in an Eastern European country, such as Armenia. A consortium of federal agencies, including the Department of Education and the National Endowment for the Humanities, funds the program. Eligible scholars must have a well-defined project that covers a few months in the country. The Title VIII Special Initiatives Fellowships award up to $35,000 to the ideal researchers who make their passion for altruism and direction to Armenia clear. Eurasian Regional Language Program offers valuable scholarships to students wishing to pursue Armenian language studies and others in what is now considered Eurasia. Awards cover a summer long program of study in Armenia, and are quite competitive. Through its affiliation with the University of California, the AGBU offers a summer study abroad program in Yerevan, Armenia. The American University in Armenia is behind this four week program that includes two four-credit courses in a range of academic fields within Armenia’s premiere universities. Students accepted into this program will live with other American students and AGBU interns and regularly adventure out on recreational trips and cultural excursions to fully experience the cultural flair and life of Armenia. Best of all, students of Armenian descent are eligible for half-tuition scholarships through the AGBU. The University of Georgia in Atlanta offers its business and related students a fantastic opportunity to study Eastern European economic changes on site in Armenia. The UGA Study Abroad in Armenia: International Business and Relations program is based in the capital city of Yerevan. Political Science, Economics and Agriculture majors are all suitable. Elizabeth Suzanne Schaefer Scholarships are given to outstanding undergraduate students participating in any study abroad program. Students heading off to overseas studies for the first time may qualify for the International Education Week Study Abroad Scholarship. Criteria include stellar academic scores and leadership. Katherine Murphy Scholarships are also awarded to first timers and in combination with academic record. UGA Alumni Association Study Abroad Fellowships are meted out to undergrads in overseas programs that are at least a semester. Academic merit applies as well as outstanding leadership. The Critical Languages Institute of ASU has developed a hands-on method of reinforcing the classroom concepts that they teach within Armenian courses in the States – their month-long program in Yerevan serves as a culturally immersive way of bringing to life student’s pursuits in Armenian languages. This program can be taken at either the elementary or the intermediate level, depending on a student’s comfort, but either way the course will be very intensive as it includes volunteer work in the country in addition to all the academic accomplishment. Students live in an apartment with close access to the gorgeous Caucasus Mountains and will receive three ASU credits for successful completion of the program. Funding is offered through the Melikian Center for Russian, Eurasian, and Eastern European Studies. The University of Pittsburgh Nationality Rooms are Pitt’s unique design on a study abroad program, offering students at the university a chance to do in-depth research into various countries that interest them. The Andrew J. Traina Memorial Scholarship was created solely for the purpose of providing students heading to study abroad programs in Armenia. The scholarship awards a generous $4,000. The money is given to a deserving graduate student dedicated towards the pursuit of Armenian culture and heritage. 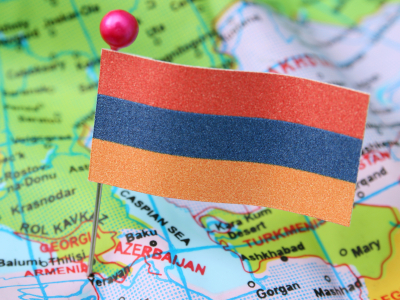 The Armenian General Benevolent Union can be your best friend and resource in terms of finding news, jobs, internships, new study abroad offerings, and cultural events related to the country. See their comprehensive listings of projects and programs, special grants, and student activities to get ideas for your study and travel plans both pre- and post-departure. Many opportunities to spend time in Armenia are made available especially for students with Armenian heritage, so if you fit the bill you may wish to check out the MBA program at the American University of Armenia with funding through Birthright Armenia. Another route you may want to check out on your journey to study abroad is that of your own college or university’s international travel or financial aid departments. At many universities, if there is not an already established study abroad program to a particular country, they will let a student create one in order to travel to the region of their choice. This option will be helpful for the student bent on traveling to Armenia, as it is a somewhat remote choice compared to more popular programs. Take advantage of this unique ability to be creative in mapping out a detailed and intentional study program that fits your needs exactly, no matter if your plans in Armenia involve an internship or a linguistic course. You will likely be able to find scholarship funding, as well, through your college’s general study abroad office, so check out their offerings to see what you and your adviser can come up with in terms of a complete financial aid package for your travels.